Simply believing isn’t enough; it’s what we do that produces the results. Our speech commands the circumstances, translating spiritual power into our domains. Be persistent, not passive. Keep exploring, meditating, reviewing and trying to gain new insight and understanding. Keep asking, seeking and knocking so He can reveal the solutions needed. Call on Him tenaciously and never give up. He interacts with our human spirits and our human minds are largely unaware of what happens in the spiritual realm. In other words, as we rely on Him, we get better results with less effort, which makes relying on God a restful work habit. The goal is to develop a restful attitude and absolutely reject anxiety in any form. Without Him, we can do nothing; but without us, He will do nothing. His goal is to keep maturing us so we become increasingly like Him and keep moving toward our life purpose. The goal is to develop a restful attitude and absolutely reject anxiety in any form. We can achieve that goal by living according to God’s Word, tenaciously applying what He shows us and not tolerating old behavior. Fear is negative faith, a negative imagination, and it causes us to believe that something negative will happen in the future. Regardless of what we think, we have authority over demons, disease, the physical world and everything in it, and we exercise that authority by acting or speaking. Simply believing isn’t enough; it’s what we do that produces the results. Our speech commands the circumstances, translating spiritual power into our domains. Instead of being passive and thinking we have no value other than our availability, we must first recognize the value of the gifts, abilities and potential He placed within each of us. Then we must actively, even aggressively, use what He has given us to perform the tasks He prepared for us. Biblical rest isn’t always a cessation of activity, but it’s definitely a calmness, an assurance that everything will conform to Father’s purpose. As Christians, we can be more than ordinary people having occasional experiences with God. We don’t need to consider Him our last resort and turn to Him only after everything else has failed. When we examine what the Bible says about our relationship with Him, we discover He wants to do more than solve our problems, supply our needs or heal our hurts. Not content with being our support staff, He longs to be actively engaged in everything we do. 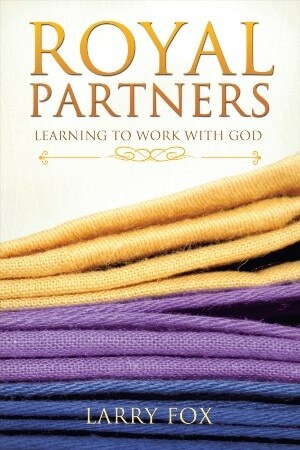 In this book, we’ll explore some aspects of the dynamic and life-altering relationship we have with our heavenly Father. We’ll discover He’s restoring the authority mankind lost through Adam’s original sin and that an important aspect of our becoming Christlike is being able to use that authority as He intends. It may surprise us to discover how He honors that authority and how it governs His interactions with us. As we learn to work cooperatively with Him, we’ll radically alter our work habits because we’ll learn to rely on Him for the desired results. More than that, we’ll begin anticipating results that only He can produce, extraordinary results by human standards. By faithfully doing our part and relying on Him to do His, we become Royal Partners with God. This sounds very similar to what God has been teaching me in the last few weeks. I pray you will be successful in exactly what God is doing in your life….and unimaginable blessing will follow. Sounds like a book I would buy and read. I just finished “Royal Partners” and I’m blown away with the greatness of this book. After hearing me talk about how great it is day after day my wife bought the Kindle version and on her first reading said thanks for recommending the book. I am 68 years old and have been retired for 9 years but being bored stiff I will be starting a business within a couple of months, in fact leaving next week for training. I saw your book on Charisma newsletters and I believe the Holy Spirit prompted me to read the free material on Amazon and I couldn’t get enough. I purchased the book and I know this is going to greatly improve my walk with God. It also alleviates all my fears and concerns of starting a business at 68 years old. My wife and I will do our part, work and walk in Gods will and He will do his part, which I already knew but through your book I can see clearly how it all comes together. God Bless you and thank you for a great book, you have made a big difference in our lives. When I saw that you are 68 and going to start a business, I was, well, for lack of a better term, relieved. I’ll turn 60 in June and have grappled with “Am I too old to start something new”? Apparently I’m at a great age to start something new! Your book may be what I need to get started. That was one of my readers, who was starting a business at 68. It’s never too late to “begin” what God leads you to do, because ultimately our part is being faithful and God’s part is making things happen. More than that, God often chooses people who feel or are viewed by others as unqualified, because then He will receive the glory when it succeeds, as He should. Thank you very much for your help,I do not deserve all this. Is His grace and I will be praying for you that God more open to us the Pastors in Africa.Thank you God richly bless you all. I haven’t read the book but I can pick the substance and recognise Jesus actually taught this. Fellow heirs and being ‘Seed’ of His seed, or in the plural of ‘Seed’, which is described also as being in heavenly places in him and he in us. I have never heard it taught. He said explicitly that “it is expedient that I go away…..to provide [‘prepare’ is the wrong option in translation] a place for you…that where I am [present tense not Future!] there you may be also. Which simply says he is literally the Way and if we don’t walk it as he provides [ that we walk as he walked ] we deny he is the way. ‘The way’ does not mean the only true religion or true saviour. That is academic theology. Walking the same walk in relation with the Father and the Holy Spirit and the word is a supernatural way. A material mansion in heaven built by the carpenter of Nazareth is carnal, like fighting over Jerusalem.